A New York City police officer who five years ago chased an unarmed teenager into his Bronx home and fatally shot him resigned from the Police Department on Sunday. 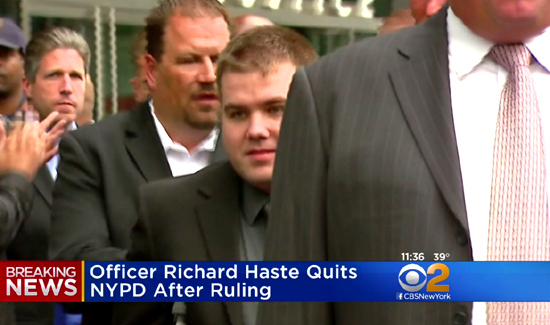 The officer, Richard Haste, 35, quit after he was found guilty on Friday in a Police Department disciplinary review in connection with the shooting of Ramarley Graham, 18, the police said. A deputy commissioner who oversaw the case ruled that Officer Haste, who had been on the force since 2008, had used poor tactical judgment and recommended his dismissal. In a hearing in January on departmental charges, police prosecutors said Officer Haste had made many mistakes when he and other officers in a narcotics unit followed Mr. Graham from a bodega into his apartment building in February 2012. Mr. Graham locked himself in his apartment, at which point, the prosecutors said, the officers should have retreated. But they barged into his home. Officer Haste spotted Mr. Graham at the end of a hallway, followed him into a bathroom and fatally shot the teenager. At the hearing, the officer said he had had no choice but to fire his gun after Mr. Graham ignored commands and reached into his pants. Officer Haste faced accusations of wrongdoing only from the Police Department; he was not charged with a crime. A grand jury indicted him on manslaughter charges in 2012, but a judge later dismissed those charges, and another grand jury decided not to charge him, causing tensions to flare and stirring accusations of racism. Mr. Graham was black, and Officer Haste is white. Mr. Graham’s mother, Constance Malcolm, said Sunday night that it was wrong that Officer Haste had not been fired previously. She placed the blame on the Police Department and Mayor Bill de Blasio.